His latest work, “Pol Pot Solved the Leprosy Problem: Remembering Colonial and Post-Colonial Worlds”, is a memoir of his days as a young diplomat in Phnom Penh between 1959 and 1961. 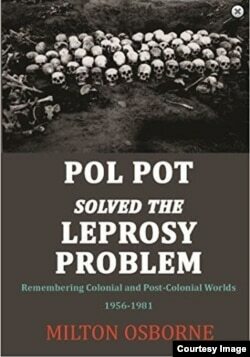 VOA: Your new book is titled ‘’Pol Pot Solved the Leprosy Problem: Remembering Colonial and Post-Colonial Worlds 1956-81.’ Can you please give us the big picture of your book? Osborne: Well, the book is an effort to provide some background on my own experiences in Cambodia and Vietnam over the period from when I first went to Cambodia in 1959, until 1981. That’s some 20-plus years that I had an experience of living through some of Cambodia’s most interesting periods and tragic periods, too. VOA: What motivated you to write this book? ​Osborne: Well, there are two things that motivated me. First of all, I wanted to record my experiences for my daughter but more broadly I wanted to focus on a period now that tends to be forgotten. Everybody is so concerned with very contemporary developments and yet what happened in the 1960s and 1970s remains of very fundamental importance. VOA: What do you mean by focusing on contemporary development? Osborne: Well, not just in relation to Cambodia and Vietnam but throughout the world there is so much news that people are constantly reading and consulting on the internet and they tend to forget the history of what had happened in earlier times. Not least in relation to Cambodia, people tend to forget the terrible events of the 1970s which led to Pol Pot coming to power in 1975. VOA: What do you think about Cambodia’s social and political trends from your first visit until today? Some people think that the 1960s were a golden age under Prince Sihanouk. Other people would say that it was not quite as wonderful as people had in their memory. So, Cambodia today is very different from the Cambodia I first encountered in 1959, but my book is not about contemporary Cambodia. My book is about the Cambodia that existed in the 1960s and 1970s. As I said earlier, I think it’s very important for people today to look back and see what Cambodia was like in those years. Some people think that the 1960s were a golden age under Prince Sihanouk. Other people would say that it was not quite as wonderful as people had in their memory. One of the things that I was very concerned to describe in the book was the events of the 1970s and in particular the problem associated with the great refugee crisis that took place at the end of the Pol Pot period, when so many people fled from Cambodia into Thailand. So those are the issues that I wanted to describe in the book. ​VOA: What are those issues? Why did it happen? Osborne: Well, that’s a very difficult question to summarize, why it happened. Cambodia was caught up in a whole series of international events. 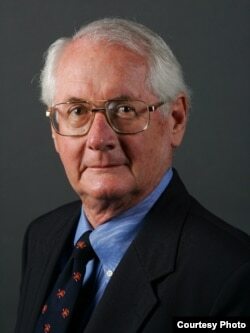 In many ways, the developments that took place in Cambodia in the 1960s and 1970s were part of a broader question in the cold war, the war that was taking place in Vietnam, the emergence within Cambodia of an extreme left wing group that came to power under the leadership of Pol Pot in 1975. Now you asked me why I wrote the book, part of the reason that I wrote the book was because I had a very large and very important (not so much large) group of Cambodian friends, only one of whom survived the Pol Pot period. I wanted to provide a background to what happened to those people during the terrible years that took place in the 1970s. VOA: What do you think Cambodian leaders should learn about the past? I think the period in the 1960s and then the period under Lon Nol in the first half of the 1970s emphasizes the extent to which embracing extreme points of view is ultimately very dangerous for any country. ​Osborne: Well, I am a foreigner, so I am rather reluctant to tell other people what they should do. But I would suggest that people looking back over the period that I described in the book should be aware of the danger of embracing a point of view that provides no opportunities for different points of view, different political points of view. I don’t want to describe contemporary politics because it’s over years since I was last in Cambodia and I don’t follow contemporary politics in the same detail that I once did in the 1960s and the 1970s but certainly one of the lessons that emerged both in the 1960s and 1970s, it’s the extent to which there should be always a place for alternative points of view. I think the period in the 1960s and then the period under Lon Nol in the first half of the 1970s emphasizes the extent to which embracing extreme points of view is ultimately very dangerous for any country. Knowing history is not a way of predicting the future but unless you understand the past, unless you understand history, you will be unable to understand the present. FILE - In this undated photo provided by Documentation Center of Cambodia, the late Khmer Rouge leader Pol Pot, center, greets Khmer Rouge cadre in Phnom Penh airport, Cambodia. VOA: From your point of view, how did Pol Pot take power? Osborne: That’s the question that I think we are still struggling to understand but one of the answers or the partial answer to that is I believe Pol Pot was able to assemble enough supporters who believed that the government in Phnom Penh was so deeply corrupt that it had to be overthrown. Once the government was overthrown, Pol Pot and his associates were determined to completely remap the country. In doing so, of course, they took steps and actions that were terrible and extreme in their character. That was the basis for which you saw the terrible agricultural cooperative where people would work literally to death. It was the readiness to embrace a policy that executed people who did not agree with the regime because it’s a terrible period and I think in many ways Cambodia even today is still recovering from that period. VOA: You arrived in Cambodia in 1959, well before the Lon Nol period. What did you see at that time regarding the country’s development? Osborne: Economic development was quite still limited. Prince Sihanouk was enthusiastic for modernity, but it was extremely difficult to develop the country as he hoped. One of the things that was important in his eyes was to develop education and he founded a number of universities and promoted education. One of the great problems of that period was that there were very few jobs available when people completed their education. So, that was a major problem. Politically, one of the difficulties certainly was apparent in the 1960s, while Prince Sihanouk for all of his many qualities believed that he and he alone should determine what policies should be followed - and that created a great deal of resentment from the people who did not agree with his position. VOA: Do you think such a history of division can repeat in the future? Cambodia has been dominated over a period of history both in my book and subsequently by the role of a very limited number of people and usually by one particular individual. ​Osborne: Oh I think that’s a very difficult question to answer. To expand a little more to what I said just a few moment a go, Cambodia has been dominated over a period of history both in my book and subsequently by the role of a very limited number of people and usually by one particular individual. If you look at the situation, Prince Sihanouk dominated the 1960s and in the early 1970s, Lon Nol and subsequently Serematak dominated the period until the Pol Pot regime, Pol Pot was dominant in the 1970s and then after the Vietnamese departed, toward the 1980s, the government or the leadership of the Cambodian People’s Party by Mr. Hun Sen has been dominant. So a single individual figure has played a major part in Cambodia’s modern history. VOA: What would you say was the most important thing for Cambodians to remember about their past? Osborne: Well, I think perhaps one of the most important things they should not forget is the disunity that took place at of end of the 1960s and then in the 1970s, that led to a terrible crime of the Pol Pot regime. That is a situation or fact that they should not forget. Why Confront the Horrors of History?